Eighteen years ago a teenage pregnancy changed Kate Worthington’s life forever. Faced with many difficult decisions, she chose to follow her heart and embrace an uncertain future with Glenn Ferguson, her devoted first love…and the father of her baby. At the same time, in another part of the world, sixteen-year-old Ryan Hamilton makes his own share of mistakes, but learns important lessons along the way. 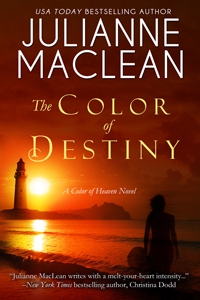 Soon Kate’s and Ryan’s paths cross in a way they never expected, which makes them question the existence of destiny. Even when all seems hopeless, is it possible that everything happens for a reason, and do we end up exactly where we are meant to be?